In Memory of Clifford Briggs (1922 – 2019) who was an inaugural 2007 Indiana Oil and Gas Association Hall of Fall Honoree along with Hugh S. Barger, Henry R. Gwaltney, James E. Kendall, Lester D. Moore, and C.A. Robison. Below please find Clifford’s obituary. Indiana Oil and Gas Association Board of Directors extend our deepest sympathies to the Briggs Family. Clifford Carroll Briggs, 96, of Newburgh and formerly of Mt. Vernon, IN passed away March 19, 2019, at Primrose Memory Care. He was born September 24, 1922, in Browns, IL to the late Otis and Ethel (Fieber) Briggs. Clifford was a graduate of Albion High School. He had been a medic in the U.S. Army. Clifford was an independent oil producer and was the owner of farming operations. He had been on the Board of Directors for Peoples Bank and Trust for many years. Clifford was a member of the Western Hills Country Club, Elks, and the American Legion. In 2007, he received Inaugural Recognition in the Indiana Oil and Gas Association Hall of Fame. Clifford enjoyed fishing, golfing, gardening and traveling. He was preceded in death by his sisters, Dorcas Vance, and Geneva Shepherd; and brother, Kenneth Briggs. Funeral service will be held at 11:00 am on Friday, March 22, 2019, at First United Methodist Church, 601 Main St., Mt. Vernon, IN, with Rev. David Stevens officiating and burial to follow in Bellefontaine Cemetery. Thank you to Primrose Memory Care and Southern Care Hospice for their comforting care. Most folks in the Sa­lem area are prob­ably familiar with the dozens of ‘.’nodding donkeys” that dot the coun­tryside throughout Marion County. After all, these iconic oilfield contraptions have been pumping “black gold” in Marion County for decades. But some folks may not be aware that they are also are literally pumping mil­lions of needed funds into the county’s public school systems. Illinois oil production is assessed and taxed as real estate, similar to property taxes paid on a residential home. All of the revenue collected from this tax stays at the local level and goes directly to support the areas where oil is pro­duced: counties, villages, townships, cities, and most importantly, local schools. to 2013. This revenue is absolutely critical, not only because Illinois public schools rely on local prop­erty tax revenue for more than 60 percent of their funding, but also because those schools simply can­not rely on our infamously debt-crippled state govern­ment to meet its relatively meager education funding obligations. Illinois ranks dead last in public school funding that comes from the state. And due in large part to a pension crisis, that already inadequate public school funding has been pro-rated at 89 percent in recent years, placing even more burden at the local level, where too much has been asked in the first place. This is just one example of why Illinois’ oil production industry is so important to the state – a fact upstate “Keep It In the Ground” activists should keep in mind the next time they suggest the oil industry should be done away with entirely. For more on the Illinois oil industry’s contributions to the state’s economy, check out RCF Economic & Financial Consulting’s economic impact report. The newest class of Leadership Crawford County recently had the opportunity to learn about Illinois and Crawford County’s oil history at the Oblong Oil Field Museum. The visit included a personalized tour by longtime oil man John Larrabee of Larrabee OilCo., Oblong. Larrabee has been a longtime promoter and contributor to the museum. Also speaking to the group were Seth Whitehead and Sam Barbee. Whitehead is the new executive director of the Illinois Petroleum Resources Board. Whitehead comes to the IPRB after a four-and-a-half-year stint at FTI Consulting, where he was most recently Team Lead of Energy in Depth, a research and education campaign focused on media outreach with regard to shale development across the country. A 2003 graduate of Southern Illinois University-Carbondale and native of Fayette County, Whitehead’s duties at the IPRB will include serving as the primary media contact for the upstream Illinois oil industry. The IPRB was formed in 1998 to provide public awareness/education programs and to clean up/restore abandoned oilfield sites throughout the state. Funding for IPRB programs comes from voluntary contributions of oil and natural gas producers and royalty owners in Illinois. Larrabee pointed out that the IPRB played a big part in loaning money for the construction of the Oil Field Museum buildings. Sam Barbee is the executive vice president of the Illinois Oil and Gas Association. IOGA is a group of oil and gas producers, landowners, royalty owners, service providers, and others in the Illinois area. They advocate for oil and gas producers in Illinois and provide networking opportunities for the industry. Before the holidays, many of us will search for the perfect gifts for loved ones. What many don’t realize, however, is that nearly every one of us will either give or receive the gift of petroleum this holiday season. When talking about petroleum, most people likely have the image of a barrel filled with a black gooey substance, or at best, a gift card for your local gas station, neither of which seems like an ideal holiday gift. But, what I’m talking about and what most people do not realize is that petroleum is part of some of the most popular gifts, from the iPad, or TV on the top of your wish list, to the many gifts asked for by children in letters to Santa. When thinking about the role of oil and gas in our lives, most people look only as far as their vehicles and the price of gasoline, but petroleum plays an integral role in nearly every aspect of our lives. Oil-based products are likely the first thing you touch at the beginning and end of each day, whether it is your alarm clock, television remote, iPhone, or even the toothpaste and toothbrush you use to brush your teeth. Those who wear make-up or synthetic fibers, such as polyester or nylon, are using or touching petroleum nearly 24 hours a day, and, as a key component in heart valves, seat belts, helmets, life vests, and even Kevlar, petroleum is saving tens of thousands of lives daily. Furthermore, oil and gas are improving our living environments by heating our homes in the winter, cooling them in the summer, and keeping our lights on and petroleum-based gadgets fully charged. These are just a few of the improvements that oil and gas makes in our lives and societies around the world. And, in the same way that we take great pride in our agriculture sector and the role it plays in feeding people around the world, we should also take great pride in the role our oil and gas industry plays in providing a commodity essential to our very way of life. Affordable energy is essential for almost every aspect of our modern lives. Without it, we wouldn’t have many of the things we often take for granted. Affordable energy is needed to run hospitals and laboratories that improve our health. It’s required to deliver electricity to our homes and put fuel in our vehicles. It also supports millions of jobs associated with all of these things and more. This year (2018) will go down as another year of historic growth of oil production and opportunity across the nation. We should take a moment to recognize the incredible impact our oil and gas industry has had on our state, our nation, and the world. The technologies and innovations developed here in America to unleash our abundant oil and natural gas reserves are bringing us closer to energy independence. Our nation’s energy abundance can be used to lift people up. More than a billion people around the world face challenges for adequate food and education, clean water and protection from heat and cold due to lack of access to energy. We should work to ensure more people have access to safe, affordable, and reliable energy, no matter which state, nation, or continent they reside. Because to rise out of poverty and enjoy health and safety, people need more energy, not less. As an industry, we are proud to produce a resource that is used to fuel the airplanes and vehicles that will bring families together this holiday season; the resource that will go into the gifts that will be exchanged; and the resource that is bringing us closer to energy independence. On behalf of the oil and gas industry, we wish you all a happy holiday season. For the first time in nearly 75 years, the United States has become a net exporter of petroleum, which consists of crude oil and natural gas liquids. Seth Whitehead, Executive Director of the Illinois Petroleum Resource board, says shale drilling in places such as Texas and New Mexico, over the past ten years, is mainly responsible for the breakthrough in petroleum. Although there’s no shale drilling in Illinois, oil production is still a major part of the economy. The state’s oil wells pump 8-9 million barrels of crude oil annually. That’s just one day’s worth of crude oil production for the entire country. “It’s a small piece of the pie, but the impact that our small industry has on the state is anything but small,” Whitehead says. Illinois has about 650 oil fields, mostly located in the southern part of the state. Whitehead says the industry directly employs 4,000 workers, mostly in White and Lawrence counties. Read More & Watch Interview. Lester D. Moore, a leader, and advocate for the oil and gas industry on both the local and national level, passed away on October 27, 2018. Lester was born October 12, 1933, in the small hamlet of Ellery which is located in both Edwards and Wayne Counties, Illinois. He grew up on a small farm where life was a challenge. Lester told of a friend who stated that he was in good shape when he got a new piece of cardboard to put inside his shoes. After graduating from Edwards County High School, Lester traveled to Champaign to attend the University of Illinois where he graduated with a Petroleum Engineering Degree. Upon graduation, he entered the Schlumberger training program but then was drafted into the Navy where he spent two years in the Civil Engineering Corps. In 1957 he arrived in Evansville to work for Barger Engineering from 1957 to 1960 and then Campbell and Rickman from 1960 to 1967, both petroleum engineering firms. He soon struck out on his own to seek work as an oil consultant. He worked with operators and gained valuable experience in the industry, especially with secondary recovery operations. With the downturn in the industry in the 1960s, he decided to pursue development and operations for himself. The first few months were tough with Lester stating “I remember that the books had less than one page in them – the entire entry of expense and income.” Like all fledgling oilmen, he borrowed enough money to purchase a couple of stripper leases and as his production grew, he began to drill his own wells. In 1980 and 1981, he drilled 89 wells. Over the years, Lester continued his oil business through Moore Engineering and Production Company, Inc., (Mepco), and Southern Triangle Oil Co. He had offices in Evansville and Mt. Carmel and an equipment yard in Grayville. He also operated a supply store in Crossville. Lester’s career in the Illinois Basin spanned over 60 years. He remained active to the end. With his technical knowledge, experience, and expertise, he stood out in leading the industry in development and operations. He was always available and generous with his technical advice. Lester was highly respected in the Industry. Barry Russell, the President and CEO of the Independent Petroleum Association of America stated “Lester was a strong part of the IPAA Volunteer Leadership for almost 40 years. It was a privilege to not only work closely with Lester on issues but also to consider him a close friend. 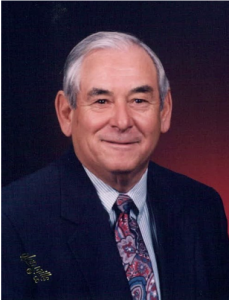 On the board in those early days as well as at the time of his death, Lester was a tireless supporter of our Industry and of IPAA.” Craig R. Hedin, President of the IOGA, stated “Lester was one of my first clients in 1975. He was a most valuable mentor and friend for over 43 years – a great man. He would sit in meetings with his arms folded with that grin on his face. He would let everyone have their say and then he would speak his words of wisdom that cut right to the issue. He will be missed.” Mike Gibbons, Petroleum Engineer and former associate with Lester, was feeling stress on engineering a waterflood for Lester only to have it put into operation with oil at $9.00 a barrel. Lester advised that if oil prices did not come up within the next 6 to 12 months, it won’t matter because broke is broke and most small independents would be gone. His next bit of advice has stayed with Gibbons as he rose in the ranks to manage young engineering and geological staff over the years. Lester’s advice of “manage the things you can and cope with those things you cannot” has proven to be timeless. 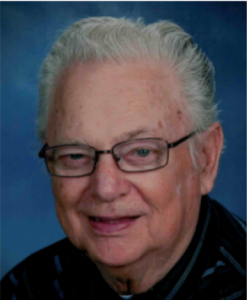 Lester was an avid Fighting Illini fan, was a U.S. Navy Veteran, and a lifelong member of the Methodist Temple. Lester would be the first to credit his longtime employees for his success – Paul Hyatt, Whitman Myatt (a/k/a Unk), Stuart Davis, Wanda Embry, Charley Campbell, Ryan Bunnage, Melinda Sharp and Kelley Hoepner, all of Mepco; and Lynette Wiles and Roger Keen of Southern Triangle Oil Company. His associates have included, among others, Delwin Parker, Doug Reynolds, Jr., and Mike Gibbons. Lester was preceded in death by his wife of 61 years, Joyce Moore, in 2017, and his parents. He is survived by his daughters, Leslie Hyland (Mike), Melinda Sharp (Jimmy), and Alyson Ross (Bennett); together with his grandchildren, Jennifer Kemling, Jeff Hyland, Stuart Davis, Jon Hyland, Jacob Ross, and Sam Ross; together with great-grandchildren, Payton, Carter, Cash, and Amelia; together with his brothers, Leroy Moore (Betty); and Chip Moore (Wilma). Lester is also survived by nieces, nephews, and cousins. Funeral services for Lester were held on November 2, 2018, with burial in Bethel Cemetery in Ellery, Illinois. Memorial contributions may be made to the Methodist Temple in Evansville, Indiana, and the Bethel United Methodist Church in Ellery, Illinois, or to the donor’s favorite charity. Farewell to an Industry Giant. We stand at a critical juncture in the life of our nation and our state. We face what could be a very consequential election cycle. In addition, uncertainties in energy market dynamics create challenges for companies and citizens. Such developments have a profound impact on every American citizens. Due to political agendas targeting oil and natural gas production, federal and state debate over taxes, regulatory issues, and energy policy often puts the oil and gas industry in the crosshairs. Also, small vocal groups of activists across Kansas and the nation continue to work to obstruct energy development under a false belief that oil and gas production and use are incompatible with environmental progress. Mischaracterizing oil and gas activity has been and continues to be a common practice and strategy for these groups. Increasing taxes and regulations results in fewer jobs because businesses spend their resources on tax burdens and regulatory compliance instead of job creation. When tax expenditures and regulatory costs increase more than the real economy, the results are destructive to economic growth. Trump administration energy policies have given our economy a substantial boost by encouraging, rather than blocking, the development of America’s vast energy resources, and by stopping the propagation of unnecessary and endless regulations that burden businesses. As a result, the economy is in a sweet spot with steady growth and broad improvement in the labor market. Going forward, the Trump administration has proposed a number of revised regulations that favors President Trump’s energy dominance agenda over duplicative and punishing regulations.